Companies today operate in a world that requires borderless security, where the trend toward anywhere, anytime access to information has significantly changed the current business environment. An increasingly mobile workforce, cloud computing and social networking all pose significant threats to information security programs. The “outsiders” are now “insiders” – people and organizations outside the traditional borders of the corporate environment may now have a role in achieving information security objectives. But at the same time, they can pose risks to protecting company data. Leading organizations view information security, including business continuity and resiliency systems, as part of an ongoing strategy that is vital to operations and competiveness. 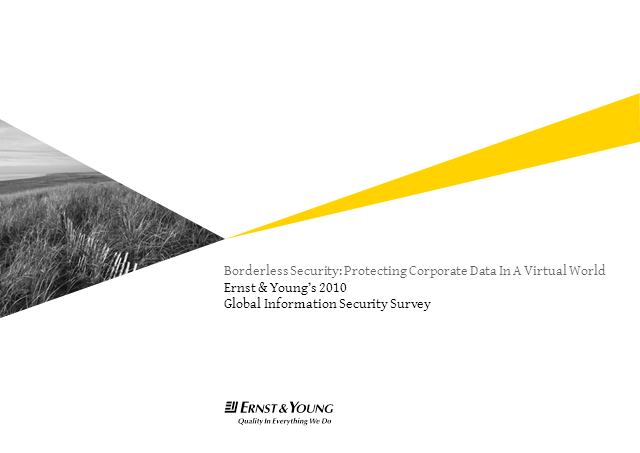 This presentation, supported with data from Ernst & Young’s recently released 13th Annual Global Information Survey, examines how organizations need to adapt and address their information security needs and protect data in the face of continually changing technology.